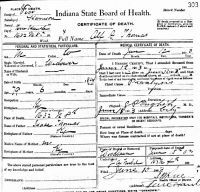 Name: Albert V. Peck; was born in Vigo County, IN, on 4 Feb 1901, child of Claud Peck (sic) and Effie Turner (sic), record filed June 1901 Book H-7, Page 2. Terre Haute Tribune, Wednesday, 21 May 1975, p. 16. "Recorded Book C-1, p. 260, Brazil, Clay, IN"
Received from Paul E. Wiliams.